By using a network analysis similar to the page-rank algorithm used by Google, Swiss researchers have compiled a “Thought Leader Map.” As their results show, the era of the great authorities appears to have come to an end. Perhaps surprisingly, this may be the first truly systematic analysis of its kind. Most lists, like TIME’s Person of the Year, or Foreign Policy’s annual list of influential leaders, are typically the results of polling experts for their opinions. But we now live in the age of social media and blogs. We can now track information and how it spreads from person-to-person. What’s more, we can now measure social influence. To compile a list of most influential thought leaders, Karin Frick and colleagues from the GDI Gottlieb Duttweiler Institute in Switzerland, took inspiration from Google. No doubt, the search engine company knows what its doing when it comes to ranking internet influence. Its algorithms work by assessing the “value” or relevance of a web page according to the number of other web pages linking to it; search engine results are very much a popularity contest. With this strategy in mind, Frick sought to determine the influence of thought leaders based upon the number of blogs and prominent website that point to them and their work. To get started, the researchers hand-picked a list of 100 prominent thinkers across a number of disciplines, including economics, sociology, philosophy, and the hard sciences. This list was subsequently sanity-checked by a select group of 50 thought leaders who named their most important influences. The researchers then plugged these names into a search engine and collected the list of the most influential blogs citing that person. Sites like Huffington Post, 3quarksdaily, Venturebeat, and even our very own Gizmodo, frequently popped-up as being amongst the most influential and well-read websites. They then took these URLs and plugged them right back into a search engine to locate the blogs that link back. This allowed Frick and colleagues to rank their thinkers according to influence. The team produced a Thought Leader Map to visualize a given thinker's internet prominence (a zoomable, detailed version can be found here). 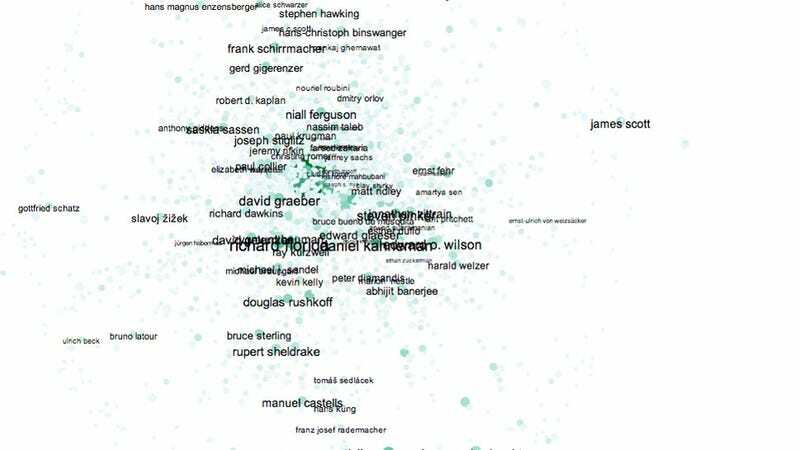 Here are the top 41 key thinkers (out of 76), compared against citation index and search hits. First place went to Richard Florida, the American urban studies theorist. Finishing in second was Thilo Sarrazin, a controversial German economist and politician. And third went to Nobel Prize winning psychologist Daniel Kahneman. Many of the thinkers listed are economists, but there are a decent number of science-minded and futurist thinkers, including Douglas Rushkoff, Matt Ridley, Ray Kurzweil, Bruce Sterling, Peter Diamondis, E. O. Wilson, Richard Dawkins, Kevin Kelly, and Stephen Hawking (among others). The diversity of ideas and thinkers also reflects the complexity of the world itself, which is “too big to know”...Knowledge volume and rate of growth are now too great for the market to be dominated by just a few ideas. Never have there been so many researchers as today – nor has academic output ever been so diverse. We can no longer rely on the old measurement systems as a means of orienting ourselves and finding relevant, new ideas.